The Ogio Aquatech Stand Bag has been designed to provide a superior, comfortable carry and deliver maximum storage for clubs, clothing and accessories. Ogio have fitted their Fit Disc four-point harness strap to the Aquatech Stand Bag. This strap features an equalizing, self-adjusting technology, that will deliver better balance and comfort. A 9” wide mouth, 4-way top that features full-length dividers will ensure maximum storage and protection for your golf clubs as well as preventing grip crowding at the base of the golf bag. Also integrated into the top design is a moulded grab handle that will make lifting and lowering to and from the shoulder much more comfortable. Four zippered pockets that feature waterproof zippers provides ample storage for extra layers of clothing and all the other accessories you need to carry around. 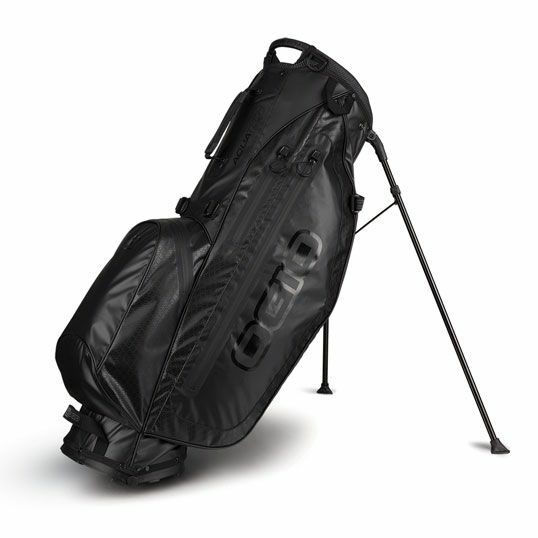 Ogio have used a lightweight, watertight fabric (1.72kg) to ensure that before you start adding clubs and accessories, the weight of the bag is superlight. A top mounted stand mechanism provides stability, and the design of this stand will also allow you to use it with a trolley.